Stateless refugees on hunger strike – Citizenship is a human right! Members of the family of stateless refugees who have been demonstrating outside the Presidential Palace from the 07/04/2017 stepped up their protest to a hunger strike from the 06/06/2017. The Hassan-Janbali family are Ajanib (stateless Kurds from Syria) and have been living in Cyprus for more than 10 years. From October 2014 till August 2015, they protested outside the Ministry of Interior, demanding recognised refugee status. They ceased their protest after the then Minister of Interior suggested immediately granting Cypriot citizenship to three members of the family who then satisfied the relevant criteria. As for the members who did not satisfy the relevant requirements, the then Minister of Interior suggested they submit citizenship applications a year later, when they would complete the required residence period in the RoC. As agreed, the family submitted citizenship applications a year later, and waited their examination for a lengthy period. On the 27/3/2017, the Ministry of Interior collectively rejected their applications based on insubstantial claims. After this development, the family began a new demonstration outside the Presidential Palace. On the 19/04/17, the United Nations High Commissioner for Refugees (UNHCR) informed the Hassan-Janbali family that the then Minister recognised, during a meeting with the Director of the UNHCR, that the above rejection was a mistake and gave instructions to re-examine the family’s citizenship applications. Since then, the then Minister of Interior resigned and a new Minister appointed. The Hassan-Janbali family have still not received a response to their just request for the reexamination of their citizenship applications and for this reason, members of the family are going on a hunger strike from the 06/06/2017 until their request is dealt with. They have taken this decision fully aware of the dangers they are exposing their health and even their own lives to. 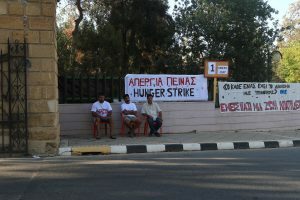 Although it is not their intention to put their lives at risk, their distress and despair are such that they have no other alternative but a hunger strike. KISA urges the competent authorities and more specifically, the Ministry of Interior to adhere to the promises made to the Hassan-Janbali family, as well as their obligations towards refugees in general, and grant the members of the Hassan-Janbali family Cypriot citizenship immediately and before the health and lives of the protesters are at risk.